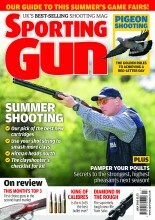 Can you recommend a good pigeon shooting seat? Most commercial shooting seats just do not stand the abuse that the average pigeon shooter gives it, they always fall apart after a couple of years hard use. My preferred seat is currently an old swivel office chair, rescued from a rubbish skip, but easily bought for a few quid from any decent car boot sale. They are not the easiest thing to carry any distance, but these days, we quad bike our gear if we have any distance to walk, so a couple of chairs are no problem. This chair has revolutionised the comfort in the hide, plus it enables us to cover a wider arc of fire, without having to stand up.